The IN GUARDIA PARADE is a re-enactment that portrays an authentic event that took place regularly inside Malta’s major fortifications of the Order of St. John. The re-enactment portrays the inspection of the fort and its garrison by the Grand Bailiff of the Order of the Knights of St. John in charge of military affairs. During the re-enactment, the soldiers and knights of the fort’s garrison - some 50 re-enactors - are kitted-out in their uniforms to perform a military drill, demonstrating to the Grand Bailiff the garrison’s state of readiness. The show begins at 11.00 a.m. and lasts 40 minutes. 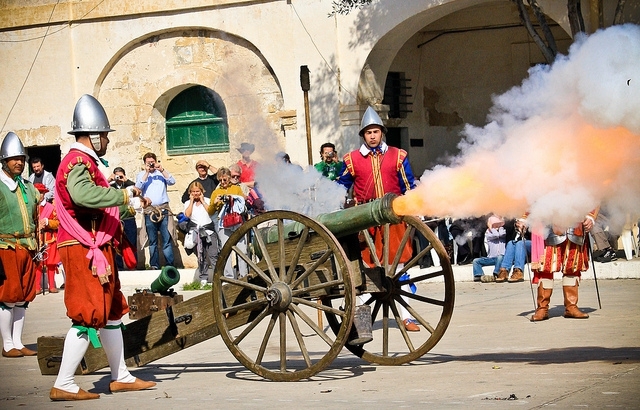 This re-enactment takes place at Fort St. Elmo, Valletta. However, in the months of June and July the shows are shifted to the Grand Master’s Palace. Please refer to the online events calendar for more information. The In Guardia Parade is organised by the MALTA TOURISM AUTHORITY. For further information please write to info@visitmalta.com.